Ben Pope, Kieron Pamment & Pat Harding celebrate Pope’s winner. 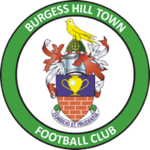 The Hillians produced a fantastic performance to beat high-flyers, Folkestone Invicta, 1-0 in the Emirates FA Cup. 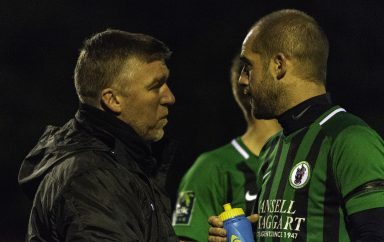 The Hillians have always enjoyed an FA Cup run in previous years, and would be hoping to continue that trend with a win against fellow Bostik Premier side, Folkestone Invicta. The visitors started the brightest, with McCann and Ter Horst both registering shots on Josh James’ goal. The first half proved to be a cagey affair, with both goalkeepers being called into action on numerous occasions. Pat Harding thought he had scored on 18 minutes, but Invicta goalkeeper Roberts had other ideas, making a superb stop. 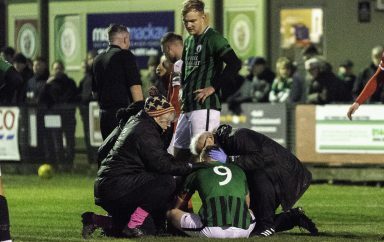 But as they say, “anything you can do I can do better”, as Josh James made an even better double save to keep the score at 0-0 on the stroke of half time. The second half was a different story. Ian Chapman’s side started playing fast, energetic and exciting football. It took them only 5 minutes from the restart to find the breakthrough. Tom Cadman excellently pickpocketed Aboagye, before striding forward, and feeding Ben Pope, who smashed the ball into the back of the net. The Hillians continued to press forward, and it could have quite easily been 2 or 3, with Harding and Pope coming close. A nervous last 10 minutes saw all 11 green and black shirts back defending. Folkestone pressed and pressed, looking to force a replay, but Gary Elphick’s defence stood firm. 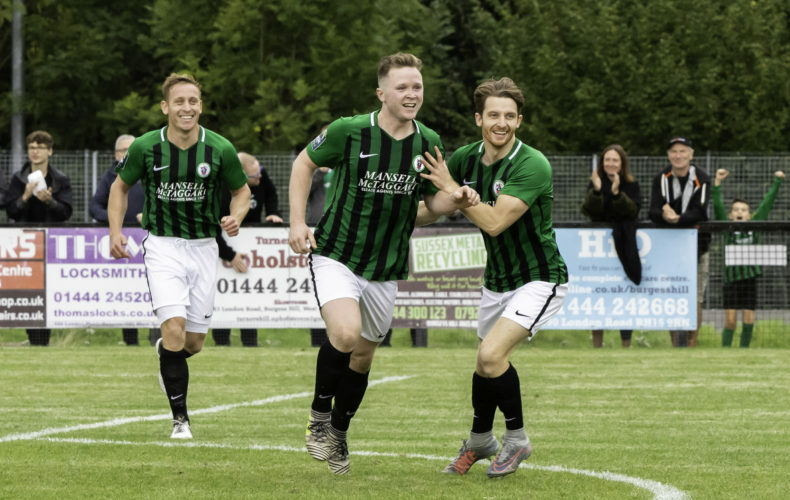 The Hillians progress to the Second Round Qualifying of the FA Cup once again, with Ben Pope’s effort the difference. A fantastic cup tie, and an even better team performance. The Hillians MOTM was awarded to that man, Ben Pope, who not only scored the winner, but worked tirelessly throughout. Thank you to all you Hillians who came to support the club – absolutely superb as always! The Second Round Qualifying draw takes place on Monday 10th September.